Western blot analysis of extracts from cell lines KARPAS-299 and NIH/3T3 using Bcl-xL (54H6) Rabbit mAb (HRP Conjugate). KARPAS cell line source: Dr. Abraham Karpas at the University of Cambridge. 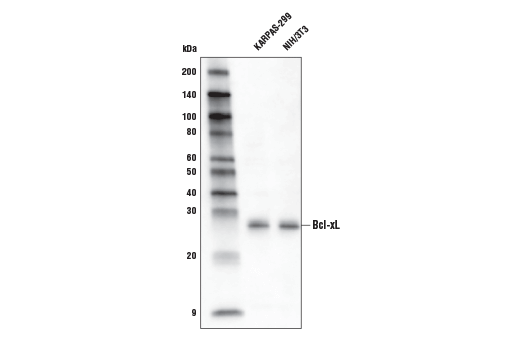 Bcl-xL (54H6) Rabbit mAb (HRP Conjugate) detects endogenous levels of total Bcl-xL protein. The antibody does not cross-react with other Bcl-2 family members. Monoclonal antibody is produced by immunizing animals with a synthetic peptide corresponding to residues surrounding Asp61 of human Bcl-xL. This Cell Signaling Technology antibody is conjugated to the carbohydrate groups of horseradish peroxidase (HRP) via its amine groups. The HRP conjugated antibody is expected to exhibit the same species cross-reactivity as the unconjugated Bcl-xL (54H6) Rabbit mAb #2764. Bcl-xL prevents apoptosis through two different mechanisms: heterodimerization with an apoptotic protein inhibits its apoptotic effect (1,2) and formation of mitochondrial outer membrane pores help maintain a normal membrane state under stressful conditions (3). Bcl-xL is phosphorylated by JNK following treatment with microtubule-damaging agents such as paclitaxel, vinblastine and nocodazole (4,5). Adams, J.M. and Cory, S. (1998) Science 281, 1322-6. Minn, A.J. et al. (1999) EMBO J 18, 632-43. Vander Heiden, M.G. et al. (2001) J Biol Chem 276, 19414-9. Fan, M. et al. (2000) J. Biol. Chem. 275, 29980-29985. Poruchynsky, M.S. et al. (1998) Cancer Res 58, 3331-8.